Browse Marshalls’ concrete drains and eliminate surface water from your development. They’re a vital component of any landscape project, and it’s essential to get the correct specification for your build. Marshalls has a range of options to choose from, which can blend into surroundings while effectively removing standing water. Whether you’re searching for a concrete drainage option for a heavy loading area or low capacity drains like the Birco 100 or 150, we offer a variety of capacities, designs and materials. 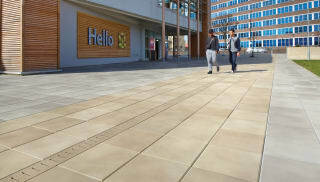 Priora Flag Permeable Paving is an ideal choice if you’re looking to keep surface water at bay in pedestrianised zones. It reduces surface run-off by allowing it to drain through the base and into the sub-base, with no need for additional drainage systems. 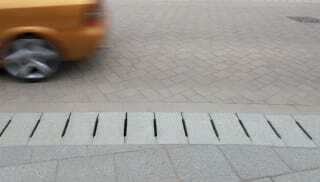 For high flow run-off on road surfaces, choose the Beany Block Combined Kerb and Drainage System. It’s a cost-effective way to reduce the risk of flooding and easy to install. Browse the full range of concrete drains from Marshalls.